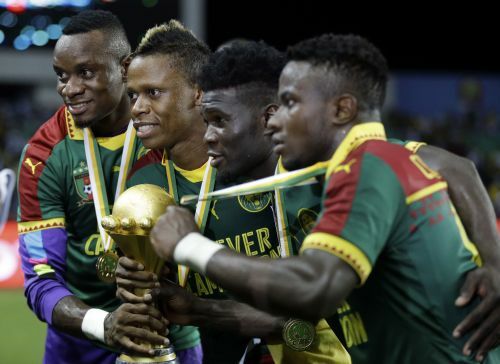 With stadiums only half-built and a violent separatist rebellion playing out dangerously close to planned venues, Cameroon was stripped of the right to host next year's African Cup of Nations soccer tournament on Friday little more than six months before kickoff. It's the fourth successive time Africa's top soccer tournament has had to change host country at the last minute. The decision was made by tournament organizer the Confederation of African Football (CAF) after a special meeting of its executive committee in Ghana, where the women's African Cup is being played. CAF president Ahmad, who goes by one name, said it was "a crucial and decisive moment for the good of African football." A new, rushed bidding process will now take place, with CAF saying a new host country would be chosen by Dec. 31. Morocco, which lost out to a joint United States-Canada-Mexico bid to host the 2026 World Cup, had already been touted as a replacement host and is seen as the favorite to step in. The tournament is scheduled to be played June 15 to July 13 and is the first African Cup to be expanded from 16 to 24 teams. Those extra teams caused Cameroon to commit to having six stadiums and not the usual four for an African Cup, and put added pressure on the infrastructure. "A number of compliance conditions have not been met," CAF said in a statement Friday, adding there was a "gap between the requirements of hosting the AFCON and realities on the ground." Cameroon's preparations had been under scrutiny since it won the right to host in 2014, but gained momentum in September when CAF, which had previously been unwilling to criticize the country publicly, said there was a "significant delay" with stadiums and other tournament-related infrastructure. The decision to dump Cameroon was likely since then but the African soccer body still gave Cameroon a last chance and scheduled two more inspection visits. One of them was to assess preparations while the other was by a joint CAF-FIFA team to gauge the security situation after an escalation in bloody fighting in the northwestern and southwestern parts of Cameroon. The violence, between English-speaking separatists and government forces, became as problematic as Cameroon's inadequate infrastructure. Two cities due to host African Cup games, Limbe and Bafoussam, are deep in the regions where the fighting is. Just last week, Cameroon's military said it killed at least 43 armed separatists in a region in the northwest close to Bafoussam and the violence has escalated dramatically in recent months. Claiming they are being marginalized in the largely French-speaking country, the English-speaking, or Anglophone, separatists also vowed to disrupt and even attack the African Cup if it went ahead. In a thinly-veiled threat, they said soccer players, officials and fans might not be safe. The unrest began in 2016 when English-speaking teachers and lawyers staged demonstrations calling for reforms. Violence increased after the government cracked down on protests and groups of separatists armed themselves. Since then, hundreds of civilians have died and hundreds of thousands have fled the killing, looting and burning. Keeping the tournament in Cameroon would have left CAF facing the possibility that some of Africa's top stars who play for big European teams would have declined to travel on safety grounds. The tournament "could not be exposed to any issues that could impact on the success of the most prestigious African competition," CAF said. Friday's decision also brought complications for Cameroon's team, which is the defending champion and was given a place at the tournament as the host. CAF didn't say if Cameroon's team would keep its place. African Cup hosting has been a major headache for CAF, with the last four tournaments not played in the country they were initially awarded to. It's held every two years — not every four like other major soccer tournaments. South Africa stepped in for war-torn Libya as host in 2013, Equatorial Guinea replaced Morocco in 2015 and Gabon stood in for Libya, which again couldn't host last year. Morocco may be the favorite to rescue CAF this time but lost the tournament three years ago after it threatened to stop fans traveling from West African countries affected by that year's deadly Ebola outbreak. Future African Cups are also an issue. CAF said that Ivory Coast's preparations for 2021 are already behind schedule. Morocco's 'regular African' World Cup 2018 Selection Error!